Trivia: Sean Young was originally cast as Vicki Vale but broke her collarbone while filming a horse-riding scene with Michael Keaton. The scene was subsequently written out of the script when Kim Basinger took over the role. Trivia: Here's a nice touch. Look at the picture of "Batman" the artist shows Knox (the one of the bat in a suit.) In the lower right corner of the paper is the autograph of Batman creator Bob Kane. Additionally, the artist is named "Bob the Cartoonist" in the credits. The Joker: This town needs an enema! The Joker: And now, folks, it's time for "Who do you trust!" Hubba, hubba, hubba! Money, money, money! Who do you trust? Me? I'm giving away free money. And where is the Batman? HE'S AT HOME WASHING HIS TIGHTS! The Joker: Thought I was a Pisces. Question: When Joker goes to Vicky's apartment, how did he know where she lived? Answer: He could have looked up her address in the phone book. Just before Bruce arrives at Vikki's apartment, Joker asks Bob the Goon for - a phone book. Also he could have been tailing Bruce and found her apartment that way, after all he does show up not long after Bruce does. Chosen answer: She's a semi-famous reporter/photographer. It would be fairly easy (especially for a criminal) to find her home. 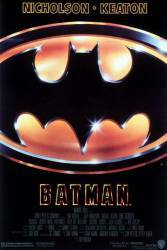 Question: Probably a dumb question, but when I first saw this film.I thought that the opening scene where a young family is mugged in an alleyway was supposed to be a flashback to when a young Bruce Wayne lost his parents. Of course we know it isn't, but is that what the filmmakers wanted us to think. Or was it just my way of thinking? Chosen answer: It foreshadows what will be learned about what happened to Bruce Wayne's family and what set Batman on his path. Question: Could anybody explain me how did they turn Jack Nicholson into the Joker? I know it's just make up, but how did they made that Joker smile? Chosen answer: His smile is natural but the depressions in his face were made using fake skin and makeup.